Choreographer Camille A. Brown's new community outreach project challenges the perceptions and dreams of young black women. Brown leads a Black Girl Spectrum session at Gibney Dance Center, NYC, in April. She then gives them a chance to dance what those words look like. No one hesitates or feigns shyness. Limbs fly and hips swing; the girls’ commitment and glee is palpable. “So where was that before, when I gave you structured dance?” Brown asks. “Let me have it!” She throws her arms wide: “Let the space have it!” This time, when the dancers resume the earlier phrase, the room explodes with smiles and genuine, spirited enjoyment. For these teenage girls, this is a special day. They are students at the DeVore Dance Center in Queens, where Brown herself studied as a young girl, and they’re clearly in awe of her. Before class, as they warmed up, they’d watched her perform: full-throttle, her tiny but powerful frame first running desperately in place, then stomping the floor, her face at once fierce and beatific. You could’ve heard a pin drop. Brown demonstrates her full-throttle approach to movement. Their admiration is well-earned. After graduating from LaGuardia High School for the Performing Arts, Brown went on to get her BFA at the University of North Carolina School of the Arts. She joined Ronald K. Brown’s African-contemporary company straight out of school. But the choreographic bug, which first bit her in college, soon took over: She won Hubbard Street Dance Chicago’s competition for emerging dancemakers at 22 and quickly made a name for herself with commissions from Alvin Ailey American Dance Theater and Complexions Contemporary Ballet. Now she’s the artistic director of her own eponymous company, racking up accolades, including a New York Dance and Performance Award (Bessie) and the coveted Princess Grace Award. For Brown, too, this day is special, although for different reasons. The class she’s leading is part of her company’s community outreach project, Black Girl Spectrum. For the past year, while at home in New York and on tour, Brown and her dancers have been leading workshops meant to empower black girls. Over the course of a couple hours, each small group of 15 to 20 discovers how movement can be a vehicle for expression and creativity—and offer healing. Not every Black Girl Spectrum workshop is movement-focused. In fact, many of the approximately 125 women who have participated in the program over the last year—including female inmates at the Northeast Reintegration Center in Cleveland—aren’t dancers. Recently at the Brooklyn Children’s Museum, for example, Brown and her company kept the focus on dialogue. Within the quiet confines of the museum’s library, Brown asked the girls before her to sit in a circle as, one by one, they finished three sentences: I am; I feel; I know. Their responses ran the gamut of silly to surprisingly self-aware. When she did introduce movement, Brown did it subtly, asking the girls to describe themselves in just one gesture. One raised her arms to either side of her head to flex her biceps, her smile wide. Another pretended to straighten an imaginary tie. They learned each other’s gestures, creating one long phrase that they repeated, faster and faster, their concentration broken only by an occasional giggle. Once it was all over, Brown let them in on her sly trick: “So what did we just do?” she asked. “You told a story,” says Brown. Company members show excerpts from Black Girl: Linguistic Play, set to premiere in September. Pictured here (L–R): Beatrice Capote and Fana Fraser. Experiences and feedback from the Black Girl Spectrum workshops are evident in Brown’s newest work, Black Girl: Linguistic Play. Premiering next month at The Joyce Theater in NYC, the piece explores black female identity in urban America. Familiar gestures, reminiscent of the Brooklyn Children’s Museum session, are easy to spot: Two dancers engage in a movement conversation—one fiddles with an earring; the other snaps her fingers. Hips swivel and hands beckon as they primp in front of an imaginary mirror. Soon, their everyday body language becomes an absorbing, full-bodied phrase, full of rhythmic surprises and sudden weight shifts. One particularly adept pairing took place during the company’s February tour to Minneapolis, when Camille A. 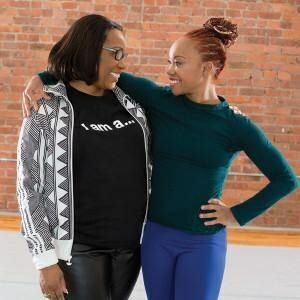 Brown & Dancers joined with a local nonprofit—also focused on nurturing positive self-image—called Lovin’ the Skin I’m In. A weeklong residency, co-presented by venues The O’Shaughnessy and Ordway Center for the Performing Arts, included student matinees, classroom visits, open rehearsals for junior high and high school students, a public performance and, of course, a Black Girl Spectrum workshop. “This year has just been about taking the time to understand what Black Girl Spectrum can be, what it needs to be for each organization and how I can make that happen,” says Brown. “My hope is to continue this and have a growing, living thing.” A recent Engaging Dance Audiences grant from Dance/USA will help ensure the program’s future. There are plans for an annual conference, too, where every organization that’s participated in Black Girl Spectrum can gather for dialogue and movement. 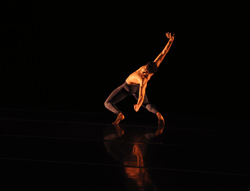 Rachel Rizzuto is an assistant editor for Dance Teacher and a modern dancer in NYC.